It's Mother's Day so today I am printing something for my Mom. When I asked her what she would like me to print for her, she suggested something that she could give away to her friends instead of something for herself. Because she is a nice person and wants to do nice things for those around her, like all great moms! 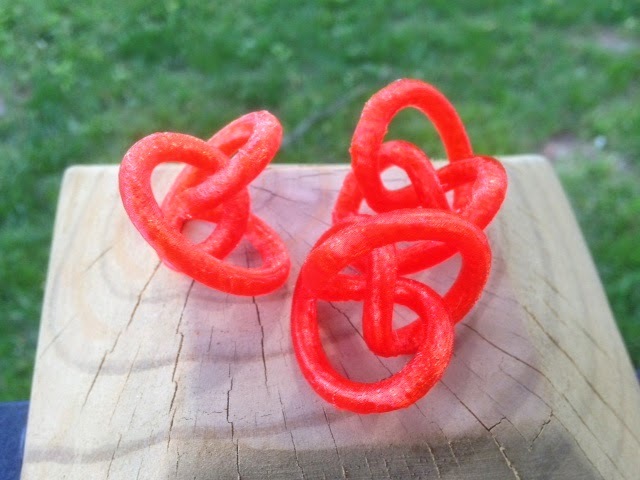 So I'm printing her a set of Rocking Knots that she can give away as she likes. I think a huge part of being a mom is thinking of other people before yourself. For example, one time when we were kids a lot of toast had been made for breakfast and one of the pieces was burned. My Mom took that piece of toast and scraped the burned top layer off into the sink, and I remember her saying that it was the "Mommy toast". That's such a little thing, she probably doesn't even remember saying that. But I do, and to this day if I'm making toast with C and one of the pieces is burned I call it the Mommy toast and take it so that he doesn't have to. Settings: Printed on a Replicator 2 with our usual support-minimizing custom profile for knots.